The first bird at your feeders and the last to leave at night, Northern Cardinals are remarkable birds. There is a lot to be said for having these little brown songbirds around. 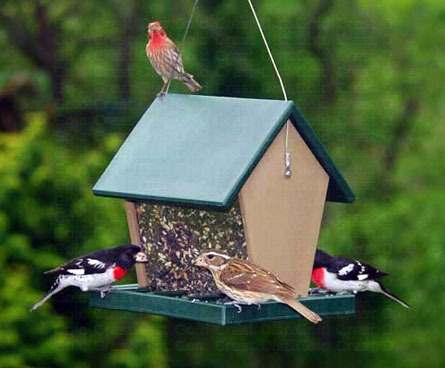 If you want to attract birds, a bird feeder and some bird food is a great place to start. 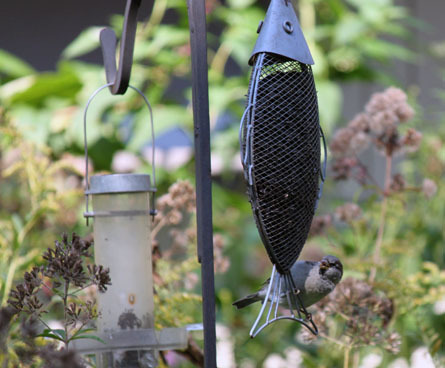 Bird feeders are easy to buy and hang, and the right food is sure to attract birds. So what kind of bird food should you get for your birds? That depends on what kind of birds you want to attract to your yard! Different types of food attract different kinds of birds. If you want to attract bluebirds, mealworms are the best type of food to put out. Bluebirds will turn their beaks up at many seeds and nuts that other birds love. If you want a bird seed that will attract a wide variety of birds, black oil sunflower seeds are the perfect choice. 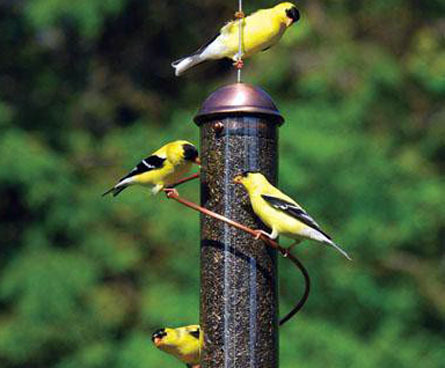 They are sure to bring different birds together on your feeder. Black oil sunflower seeds are a favorite of seed-eating birds because the shells are lighter than regular sunflower seeds, thus making them easier to get open. If you find you are getting more birds than you want at your feeders (imagine having that problem), try switching to regular sunflower seeds to attract fewer birds. Black oil sunflower seeds are likely to attract a wide range of birds. From chickadees, finches, titmice, grosbeaks, nuthatches and sparrows to cardinals, jays, mourning doves, and woodpeckers. Many of these attractive birds will stand out, making it easy for you to enjoy their time at your feeder. Sunflower seeds are a popular and less expensive option. Birds that love the black oil sunflower seeds will also eat traditional sunflower seeds, although with less enthusiasm. Many of the bird seed mixes you might find in a store include traditional sunflower seeds. Sunflower seeds can also be purchased already shelled if you prefer. 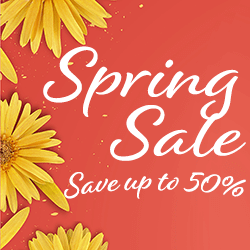 Although birds and squirrels both love these easy-to-eat seeds, buying shelled sunflower seeds can get expensive fast. Without a protective cover, shelled sunflower seeds can go bad quickly so make sure you only put out what your birds will eat in a day or two. 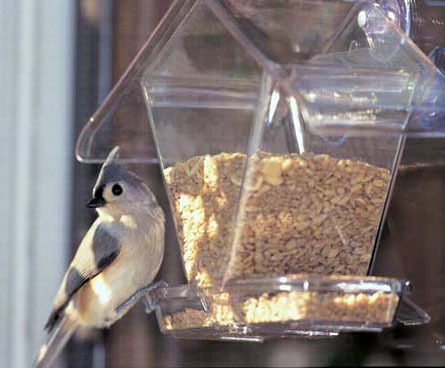 Sunflower seeds can be used in a wide variety of feeders, including trays, tube feeders, hoppers, and window feeders. 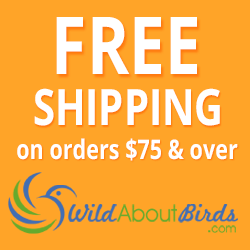 They are easy to find and are an easy choice for new birders! Safflower seeds also work well in tray and hopper feeders. Since safflower seeds are most likely to attract tough-beaked birds like northern cardinals, tray and hopper feeders with safflower seeds are a great choice if you love these colorful and vocal birds. Safflower seed also attracts chickadees and finches that will gladly eat from these feeders too! Safflower seed has the added benefit of not being a squirrel's first choice, so your feeders with safflower seeds may have less squirrel activity than other feeders! Nyjer or thistle seed (as it also commonly referred to) is another favorite of finches (and especially goldfinches), chickadees, mourning doves and sparrows. Nyjer seed is not the least expensive bird seed available so many bird watchers put it just one or two feeders that are designed to waste as little seed as possible. Nyjer seed also has the distinction of being one of the types of seeds that squirrels don't like. If you are frustrated by the squirrels at your bird feeders, try switching to nyjer seed or adding a feeder with just nyjer feed to give the birds their own feeding spot. 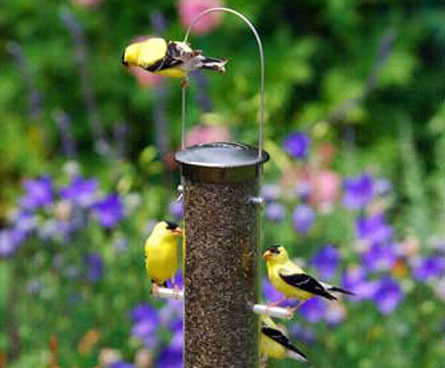 Finches and goldfinches are able to feed upside down so if you are wild about goldfinches, use nyjer seed and a bird feeder that has perches above the feeding port (instead of below it). With the perches above the food, birds have to hang upside down in order to feed and many less desirable birds will stay away from these feeders leaving more food for your goldfinches. 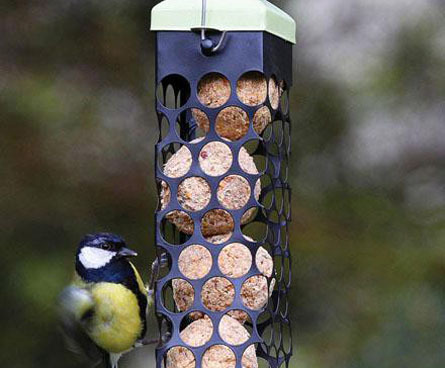 Other bird feeders that are great choices with nyjer seed have mesh screens that allow birds to pick the tiny seeds out while hanging on the actual feeder. The mesh feeders come in a variety of shapes, including balls and "socks". Finally, many tube feeders are made especially for or can accommodate nyjer seed. Just make sure the seed doesn't sit in water and go bad, as spoiled food can make birds sick. Like most other seeds, nyjer seeds have a limited window of time for the food to be out in bird feeders before it spoils. Put just enough food out for your birds, make sure you completely empty the feeder every month, and wipe it down periodically to keep the seed fresh. Suet and the specially-designed suet feeders have gained popularity as more birders become aware of the benefits of this type of food. Suet is made from animal fat and rich in energy, which is especially useful in winter because it helps birds maintain their body heat. Suet can be molded into almost any shape, making it a fun and decorative addition to your yard. Decorative shapes can be hung directly from trees, or suet can be placed into wire holders that allow birds to hang onto the holder while feeding. Suet is a favorite of several different birds. 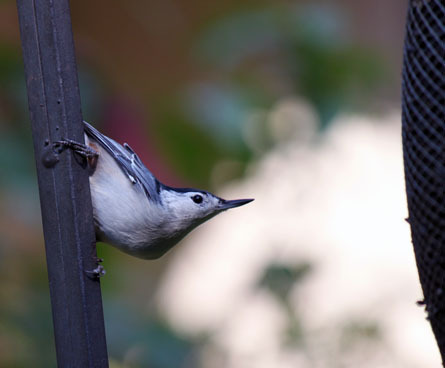 Woodpeckers, jays, nuthatches, chickadees, warblers, kinglets, titmice and wrens are all attracted to suet. They will often feed together at your suet holder, and seeing a woodpecker and chickadee sharing a meal is a great sight to see! Many of the birds that like suet are also big fans of peanuts. Woodpeckers, jays, nuthatches, chickadees, titmice and wrens are all attracted to peanuts, but if you decide to add a peanut area to your bird feeders, you may also find flickers that you didn't know you had in the neighborhood. Peanut feeders can also attract unwanted visitors like raccoons and in some areas, bears. Make sure you are prepared for the wide variety of creatures that like peanuts before putting them out for the birds in your yard. You have a lot of choices when it comes to the best food to feed your backyard birds. This easy-to-read chart should help you pick out food that your favorite bird will love! One important part of feeding birds that is commonly overlooked is cleaning the bird feeder. If the seed gets wet, empty the feeder and wipe it down. You should also clean out old bird seed and feces every week or two in the summer, with a more comprehensive cleaning at the beginning and end of the bird season. 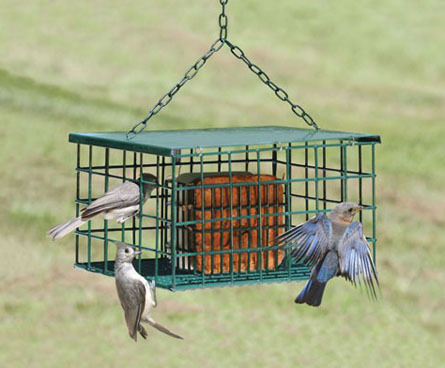 From time to time you'll want to take down your feeders and wash them thoroughly. You'll need gloves, cleaning solution or chlorine bleach, water and a clean toothbrush. Start by putting on gloves to avoid bacteria and germs. Empty old bird food from the bird house and scrape off any seed clumps or feces. Mix cleaning solution as directed or, if you are using bleach, mix 1 part chlorine bleach with 9 parts hot water. Bleach will stain clothes so be careful as you mix the bleach and water together. Scrub the bird feeder completely with a clean toothbrush and cleaning mixture. Rinse the bird feeder thoroughly for several minutes with clean water. Air dry the bird feeder in the sun. This will help eliminate remaining bleach residue and minimize the potential for mold or bacteria to grow on the wet surfaces. Make sure you wash your hands once you are done. The gloves should help you stay clean but it's a good precaution to take. Birds are easily attracted to a yard filled with yummy bird treats. Decide what kind of birds you want to visit your yard, then pick out the right food and bird feeder. There are lots to choose from. Whether you want chickadees and nuthatches or bluebirds and woodpeckers, watching your favorite backyard birds starts with offering their favorite foods!